What you see is what you'll hear! 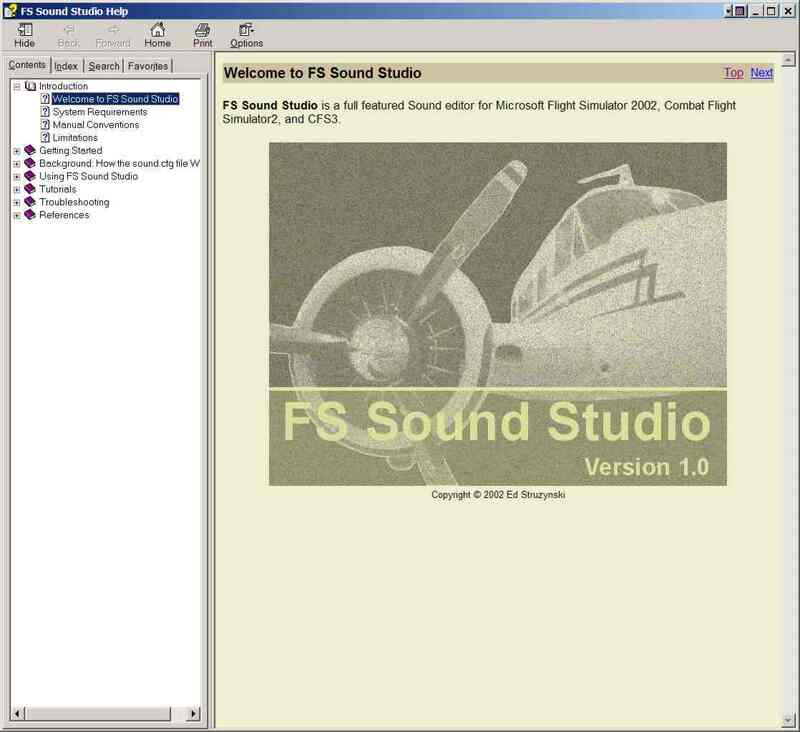 What you hear in preview mode of FS Sound Studio is what you'll hear in Flight Simulator. 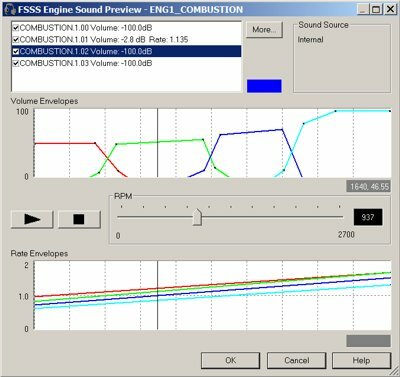 As you graphically modify the Volume Envelope of one of your engine sounds, for example, you hear the change immediately! Before FS Sound Studio you had to edit the sound.cfg file with a text editor. Instead of using your mouse to quickly drag a graph point, you had to insert a new number in a long string, and try to visualize what effect it would have. You then had to fire up your Flight Simulator to hear the difference! With FS Sound Studio, make your change and hear it instantly. With FS Sound Studio you can Preview the total sound effect of an engine. 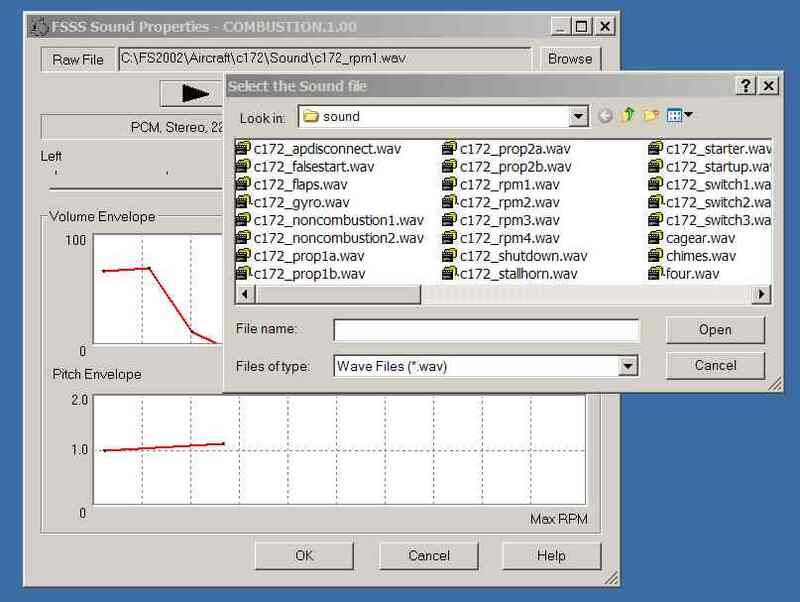 In this example, four discrete wave files are being mixed together to create the total overall sound. You can use FS Sound Studio to change the amplitude and rate for each sound to make your Aircraft sound exactly the way you want yet. Hear your changes in real time as you adjust the simulated RPM, rate and volume. Use the mouse to drag the values - no typing required. With FS Sound Studio you can browse through your sound collection to select the perfect sound file. Then add it to your configuration, modify it using your mouse, and hear your changes instantly. See and Change every Sound's Parameters. 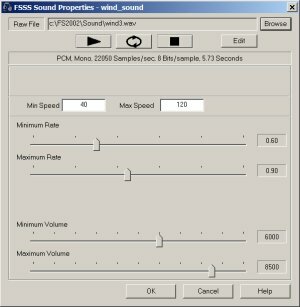 FS2004 allows you to set parameters for each sound, which change the way the raw wave file is played. 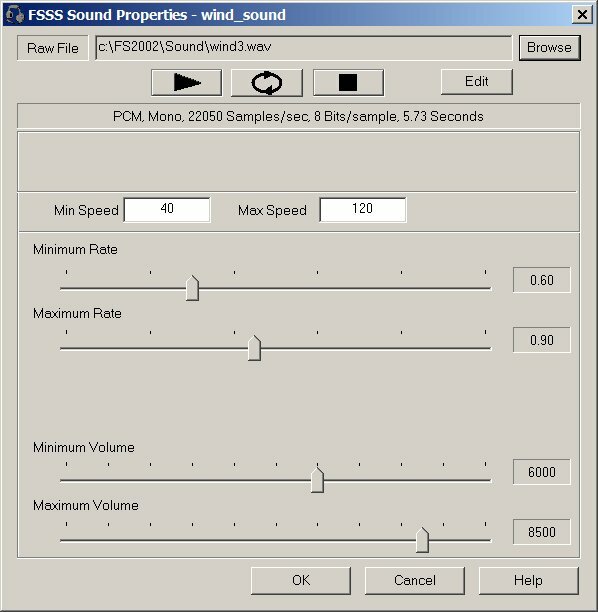 As you select a sound in FS Sound Studio, see the parameters that are available and change them instantly. 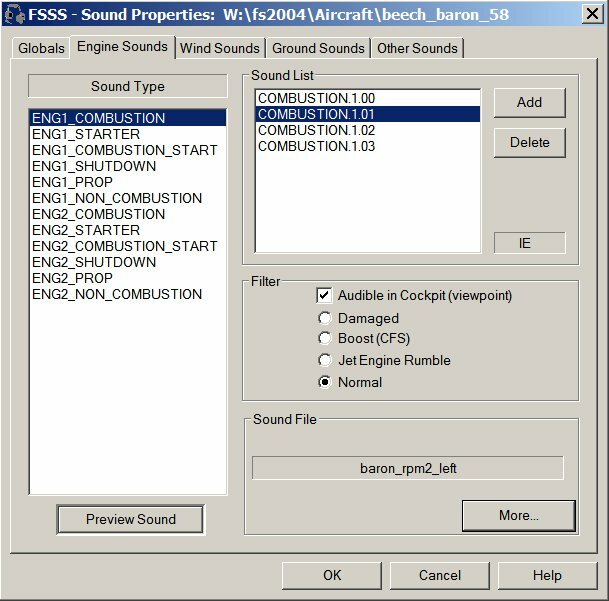 You can then preview the sound so you can hear exactly what it will sound like in FS2004! 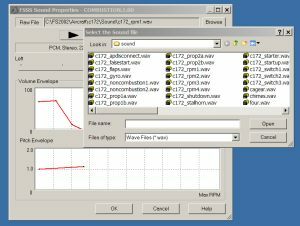 Using FS2004's parameters, you can change how a wave file sounds without editing the wave file itself. 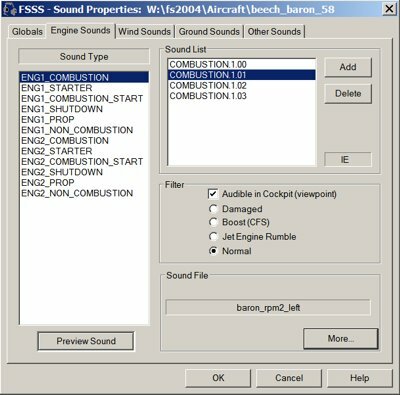 Flight Simulator uses combinations of wave files to simulate Combustion, Starter and Prop sounds. 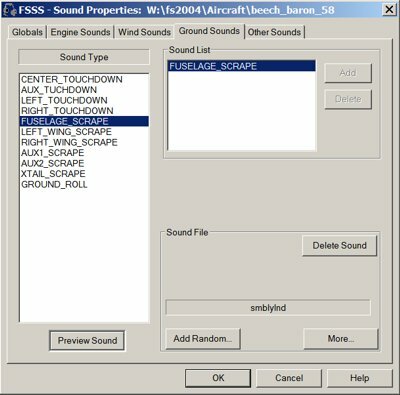 FS Sound Studio can graphically display and modify these assignments, then quickly preview how they will sound in the simulator with the push of a button. FS Sound Studio can graphically display and modify everything in your sound.cfg file, and allows you to edit them with an easy, point and click interface. 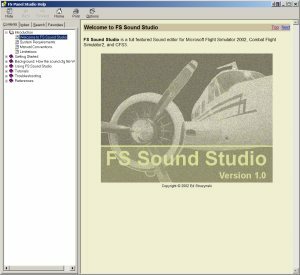 FS Sound Studio comes complete with Online Help, and a 100+ page, Adobe PDF format manual. You can download a free copy of the PDF manual to see how easy it is to create your own custom Sound configurations.